All students are now encouraged to apply on-line where possible. However, if you do not have access to the Internet, or if you need help with your application, we will help you if phone or call to the College. Please apply by the end of April if possible, however applications are open to the end of September each year. Our application service is open from November each year. Early applicants may be invited for interview before May, however most interviews are normally held in May of each year. the completion of the Garda vetting process where relevant. The College will inform applicants in a timely fashion after meeting staff. A non-refundable administration fee of €10 applies to all applications. Please note that the use of medical cards in relation to fees must be full medical cards and not doctor only. Unless otherwise stated a fee of €245.00will be payable to include administration and QQI examinations (for students taking QQI Qualifications at Level 5. An additional €30.00 is payable for Level 6 QQI Awards). These service fees include a non-refundable deposit of €35.00. Any additional fees are listed under each course outline. • Those in receipt of the Back to Education Allowance (BTEA) or Vocational TrainingOpportunities Scheme (VTOS) allowances. There may be specific entry requirements for some PLC (PostLeaving Certificate) courses and these are clearly outlined in this booklet.Leaving Certificate Applied (LCA)is an entry requirement for the majority of courses except where otherwise stated. Garda vetting is also a requirement for some courses. programmes, the Institutes of Technology and some higher education institutions operate admissions criteria and scoring system for non-specific QQI Levels 5 and 6 Certificate applicants. Work experience is an important element of all our PLC courses. The College has a wide range of contacts and can assist participants in obtaining relevant work experience placement. Opportunities for EuropeanWork Experience is provided each year in locations such as Germany, France, and Spain.This opportunity is available to students who are interviewed and deemed suitable for this option. All courses offered are subject to the approval of the Department of Education and Skills. 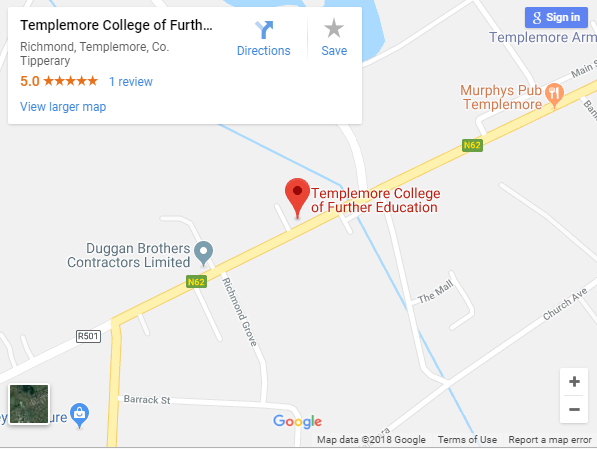 Templemore College reserves the right to restructure or cancel any course without notice. This website does not infer or impose any legal obligation on Tipperary ETB or Templemore College to provide courses or other services to students or cancel any course without notice.This prospectus does not infer or impose any legal obligation on Tipperary ETB or Templemore College to provide courses or other services to students.